Some time ago (Editor's Note: Superyacht June 2003) we presented new systems for controlling stability - Intruders and Interceptors - specifically designed and produced to be installed on fast motor boats. As an alternative to the classic flaps, this apparatus consists of a kind of metal blade, hinged parallel to the transom and moved by a one or two piston system, thus sliding up or down. When it moves down even a little below the bottom lines, this "blade" creates friction, a resistance to the progress of the hull that increases with speed and generates a significant thrust right under the stern sections such as to lift the stern and consequently lower the bow. But the benefits of this recent innovation - constant adjustment of trim both longitudinally and transversally with considerable advantages in terms of reducing roll and pitch - do not end here. New studies are being carried out in various quarters and new apparatus is being fine-tuned which, in the wake of what has already been achieved in applications on fast boats, may also bring benefits to other kinds of vessel. One of the companies that seems to have already developed new uses for this type of device is Navirex of Genoa. Engineer Mario Grasso gave us this interesting interview. What is Navirex and what are "Transom Plates"? Navirex is a Genoese company set up in 1992 which to date has completed various designs for owners and yards both in Italy and abroad. 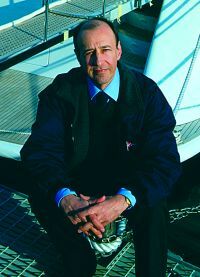 The company is organised in two divisions, Navirex Design and Navirex System, which respectively handle boat design, especially superyachts, and computerised systems in the boat field, as well as newly created systems for trim control called "Transom Plates". (Editor's Note: one of the most recent designs developed by this Genoese company is the 24 metre semi-displacement navetta "Enneffe" presented by the Mondomarine yard at the last Genoa Boat Show). These plates, created and manufactured by Navirex System, were designed specifically for the semi-displacement hull market, following numerous studies and tank testing where, in effect, we were able to ascertain that Interceptor gives good performance not only on planing but also on semi- displacement hulls. Can you tell me about this application on the Mondomarine navetta? The "Enneffe" is 24 metres long overall, with a 6.40 m beam and a full load displacement of 80 tonnes. She has two 1.300 HP MAN D 2842 LE 404 engines. This means that with Transom Plates installed she can reach a maximum speed of 22 knots, practically double the performance she should have as a round bottomed boat. There's a table, drawn up from statistical data and therefore approximate, which however gives a quick check on what the actual performance levels of a round bottomed hull of this kind should be . The owner of the "Enneffe" loves steering the boat himself, keeping her at a cruising speed of 12/16 knots. When he wants to accelerate quickly all he does is incline the Transom Plate by 30/60 degrees and, even before throttling up, the speed increases by 4 knots in three/four seconds, reaching 20 knots without any throttle at all and with the engines at a steady 2.000 rpm. This is still below the top speed of 22 knots, achieved effortlessly at 2.300 rpm, whereas without the Transom Plate the boat won't do more than 16/17 knots. 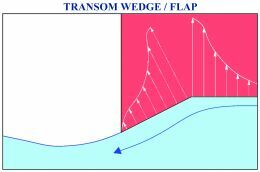 This is because the Transom Plate, with minimum friction, creates a lift similar to that created by the Transom Wedge. (Editor's Note: a sort of spoiler or fixed dihedral with a variable inclination of 3 to 9 degrees, part of the hull and made of the same material). The result is a decidedly more bow-heavy trim. If necessary however, which is to say with a big sea running when a trim with the bows very low in the water could make for heavy going, its effect can be eliminated. In practice it can be disabled, bringing the hull back to its original trim. Interceptors on fast boats also act as trim adjusters against roll. 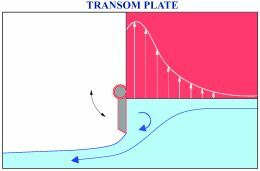 Do Transom Plates do the same? The Transom Plate effect is also similar to what you get from the well known flaps which also create lift and "raise" the stern, in effect reducing the vessel's weight. The Transom Plate idea is by no means new. It was created in the eighties in the Soviet Union but was never really developed, apart from a few military applications. It was then taken up by some European companies who used the "shutter" or "guillotine" system, that is, a blade that descends vertically on the transom, usually under the runner, projecting a few centimetres below the hull. Other companies make it with a pin at the end and with a "chopping board" action. The Navirex System "Transom Plate" is just a shorter flap, which may be inclined up to 90 degrees instead of the normal 10/15, thus bringing it into a vertical position, though it already starts functioning at 20/25 degrees. So it takes up less space than a flap and eliminates, among other things, the problem of bumping it against the quay. It is in stainless steel with suitably sized pistons and can be applied to hulls in composite, steel and aluminium. 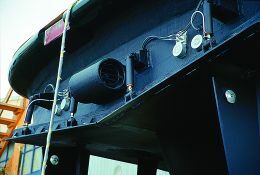 There is a control unit, usually positioned in the stern. 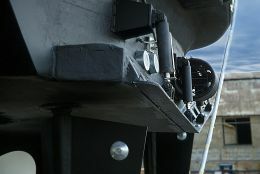 On the bridge, on the flying bridge and in the steering areas there is a joystick with which the two parts of the Transom Plate can be raised either together or separately. An analogue indicator clearly supplies the datum with the angle at which the Transom Plate is positioned. Any further developments of the system? Navirex System's next step is to make the apparatus fully automatic by linking it to the GPS, to engine revs and, lastly, to the stabilisers in order to help them do their job. However it will always be possible to disconnect it from the automatic system or actually zero its inclination, for safety reasons that will be obvious to any sailor. This system should therefore be envisaged not only for planing boats, on which it has already been widely tested, but also for semi-displacement craft, pilot boats and round bottomed yachts with fairly high speeds: vessels on which it is possible to obtain advantages of trim and speed (an increase of several knots) with a low initial cost that is moreover paid for by the great reduction in consumption.